This is what I ended up with. I found an old analytical instrument that was going to be thrown out and I salvaged the box. Inside the box I used three power supplies. From the top there is a 12v for the spindle control. Next is the 48v motor supply. And at the bottom I used an ATX power supply for the homing switches and cooling fans. 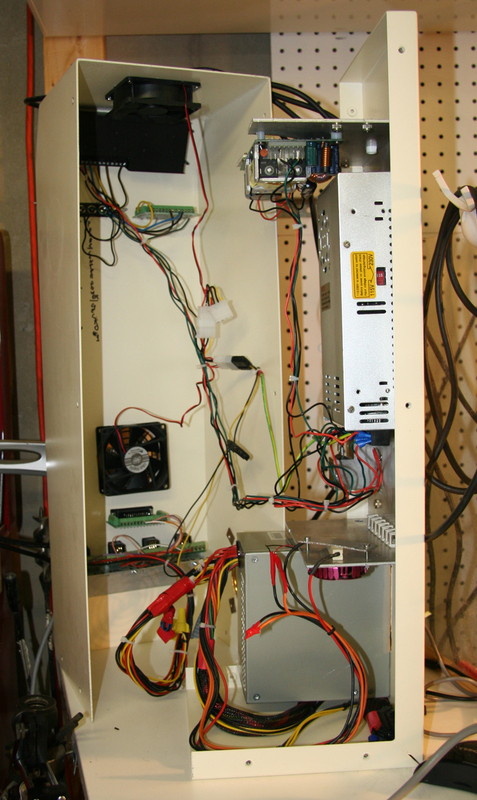 This is the back I have two plugs on for the motors and spindle another for the homing and fans. Here is the front from the top of the box. The Gecko G540 then the db25 (under the G540) is the spindle control, to the right is the probe and Estop. At the bottom is the db25 for the homing switches that attaches to a second parralell port and below that are the cat5 connectors to the opto endstops. No more noise issues the endstops work great. Glad you got it all working well. Good work, very nice and tidy!